So many things to love about Luby’s – the nice employees with hairnets, the silverware wrapped in warm green cloth napkins, and the food! Chicken fried steak, the massive sized broccoli, baked almondine, blackened tilapia, and who could forget their green jello! 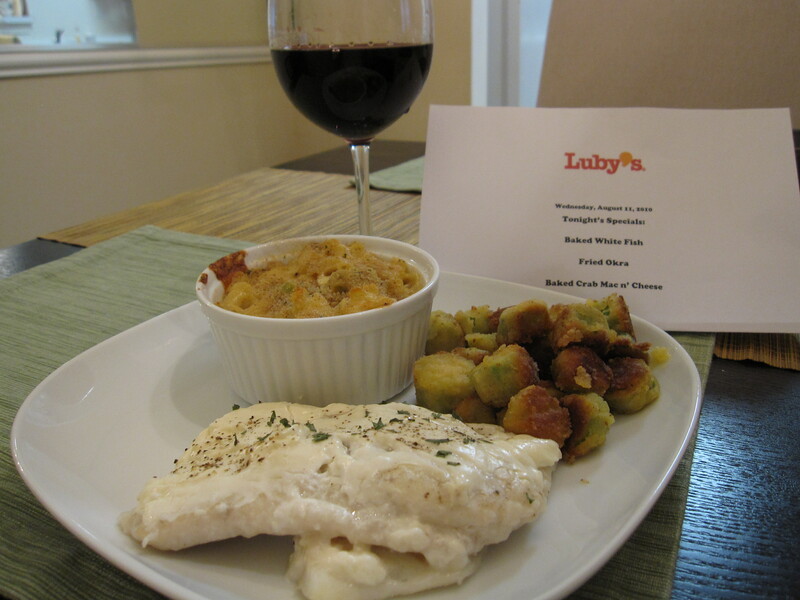 I tried to get creative with my menu last Wednesday and created a Luby’s-themed menu: baked white fish, mac & cheese, and fried okra. For the baked white fish, it didn’t exactly come out Luby’s-style with that gooey-fatty layer on top. For that, I’m opting not to put the recipe on here. But for those interested, I chose orange roughy as my fish, seasoned it with salt & pepper, and layered it with mayo (as all the recipes I read said to do) and some parsley. Baked it for 20 minutes at 350 degrees…and sure enough, it tasted like baked fish with mayo. You win some, you loose some. I will figure it out one day. 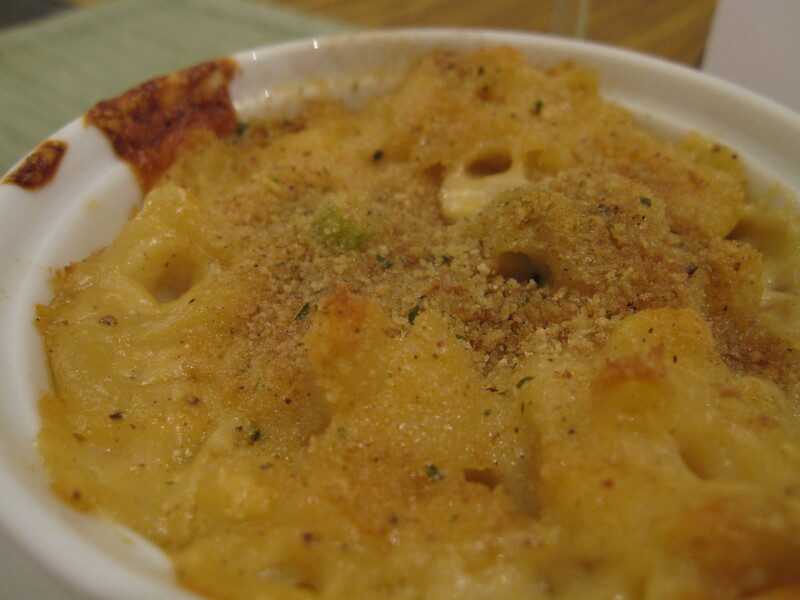 On the other hand, the mac and cheese turned out delicious. First time making it too. I essentially took Ina’s recipe (here) and didn’t include lobster. Preheat the oven to 375 degrees F. Drizzle oil into a large pot of boiling salted water. Add the pasta and cook according to the directions on the package, 6 to 8 minutes. Drain well. Meanwhile, heat the milk in a small saucepan, but don’t boil it. In a large pot, melt 6 tablespoons of butter and add the flour. Cook over low heat for 2 minutes, stirring with a whisk. Still whisking, add the hot milk and cook for a minute or two more, until thickened and smooth. Off the heat, add the Gruyere, Cheddar, 1 tablespoon salt, the pepper, and nutmeg. Add the cooked macaroni and stir well. Place the mixture in 6 to 8 individual gratin dishes. Sprinkle the top of dishes with fresh bread crumbs.